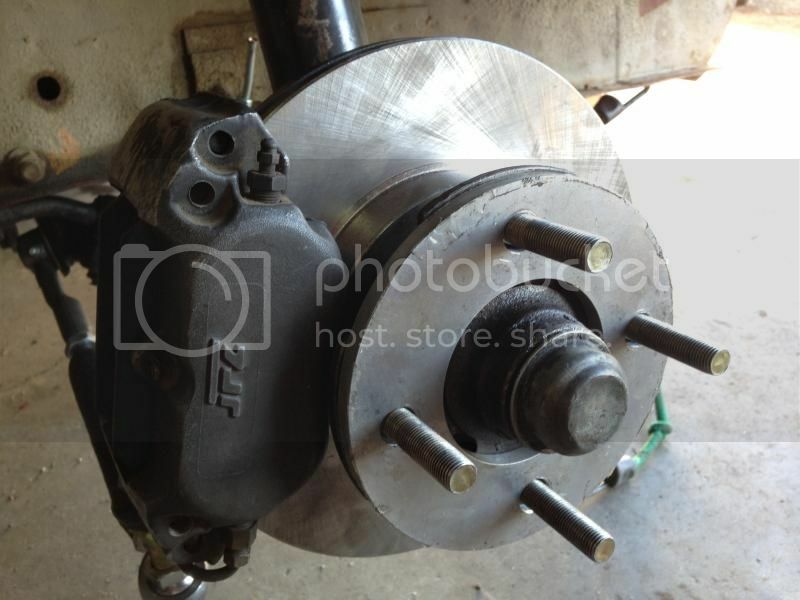 Has anyone been able to run the JFZ front calipers on a 510 Strut / Hub assembly? I may have to make adapters and run IQ font rotors, but just wondering if anyone has done this. Which caliper? I have run the Mini GN's way back, and now run the modern equivalent from BRAKE MAN. Also, I made mounts for the 280zx strut, not the stock strut. The early JFZ's flexed like crazy, I hated them. Then I went to Wilwood, same thing. The Brake Man have been awesome. Do you by chance still have your CAD file for the mounts? Also, what rotors did you use? No..this was done LONG before CAD stuff. The rotor is just the stock 280ZX one, nothing fancy. Our cars are light, so with some proper cooling and discs on the back braking is more than adequate for road racing other than the most severe conditions of little cool down period between corners. For a street car they are beyond awesome. My setup will clear a 13" early Panasport wheel, zero offset, 15" are not an issue at all. Mounts for stock struts would be different for mounts for ZX struts. Rotor and hub choice will also affect design. If you're looking for a JY BBK, the Z31 11" vented rotors, Z31 hubs, ZX struts, and Wilwood calipers can be made to work together with a simple 2D dogbone bracket. Outlined in DQ 5.3. Wilwoods aren't the stiffest, but the design could be easily adapted. jaredperry wrote: Unsure of the Model. The best thing I can suggest and lots of respect due for doing so. Get your car parts you want to adapt and design the mounts, adapters, and other bits in your CAD system. Even if you mimic a similar design, but you did all the measuring and model work for yourself. That is cool stuff and you did it. I know that there are CAD sharing sites on the interwebz too. www.Grabcad.com is one I believe. A good friend of mine is in the process of making this happen with solidworks. We are using a late 80's vented honda civic rotor to allow enough clearance in a 13" wheel. The JFZ brakes should be able to mount to the 510 hub with ease. The hub had to be milled a little and the mounting holes elongated as well. jaredperry wrote: and the mounting holes elongated as well. That doesn't sound optimal. The Honda rotor doesn't have the right bolt center to bolt to the 510 hub? Do you have pictures? Might be better to turn down the OD of a ZX rotor or similar to get the OD you need. ZX brakes (and shaving the ZX caliper some) fit into 13" wheels. Depends on the JFZ caliper and the particular wheel you're using. I'm in the process of restoring an old GT4 510 with JFZ brakes on the stock 510 struts. Unfortunately the car is in FL at the body shop and I'm in AL. I'll be picking it up later this year and can send some pictures. The brake brackets should be finished this week. I will post up pictures of the bored hub and brackets at that time. FYI... the JFZ is the same as the Willwood bolt pattern, so the brackets are pretty much universal. This is also on a OEM 510 strut assembly and fits easily under a 13" wheel and available to purchase for others you don't want to upgrade the strut assembly and your wheel size.